The names – Ok, the names made me cringe. They are so sickly sweet and too twee for me. 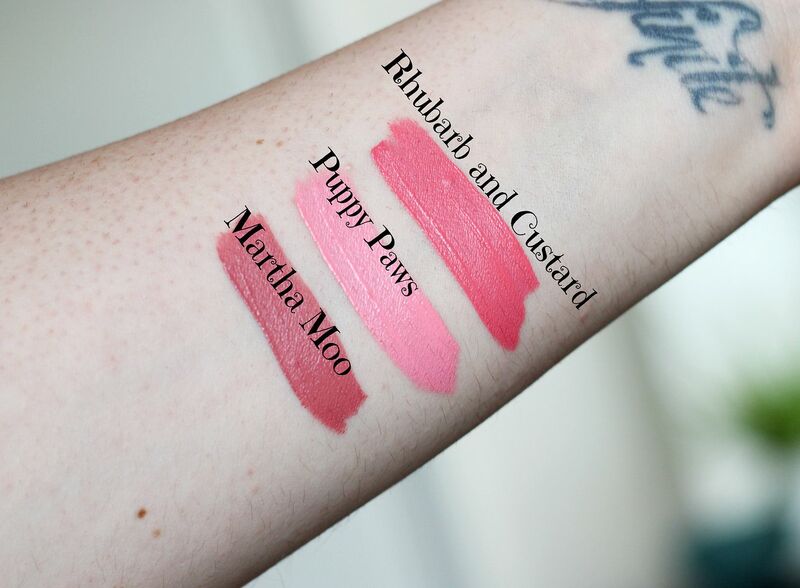 The shades – Martha Moo is a gorgeous mauve, Rhubarb and Custard is a nice warm toned coral pink and Puppy Paws is a white-based neon pink shade. I think Puppy Paws is almost unwearable, in terms of brightness. Martha Moo is gorgeous, and the best one. I can see this suiting everyone. The packaging – Neutral. Frosted tube, TB logo, gold lid – no complaints here. The formula – These are highly scented – they smell just like the NYX soft matte lip creams (identical vanilla cake scent). The formula is pretty decent, I think. Nowhere near as good as KVD or Jeffree, but heaps more comfortable than Coloured Raine. It’s not too drying, but it does feel a little crumbly when you reapply. When I googled the ingredients, the formula looks so similar to the Milani ones – just an FYI. They also look pretty similar to the Makeup Revolution ones. Overall, I think these are decent – you can get better, but you can get worse! For £5.99, I’d recommend Martha Moo, just for the beautiful shade. Have you tried anything from Tanya Burr?